Features: 160 one ounce servings per hour. 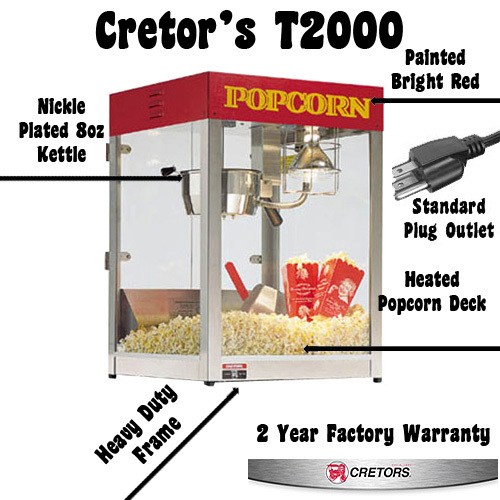 The T-2000 offers increased popping capacity, with a compact footprint. The red top is painted with Cretors special powder coating that resists scratching. Designed for use with 8 oz. portion packs. Online purchases may inquire addtional cost depending on ship location. This item must ship by truck. Please call for best ship rate. 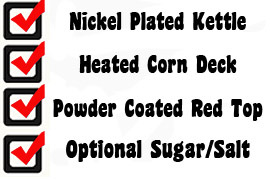 Can be upgraded to salt/sweet switch for Kettle corn.